Los Angeles, CA, United States (4E) – Drake and Rihanna took to their social media accounts on Saturday to mourn a fan who recently passed away due to cancer. 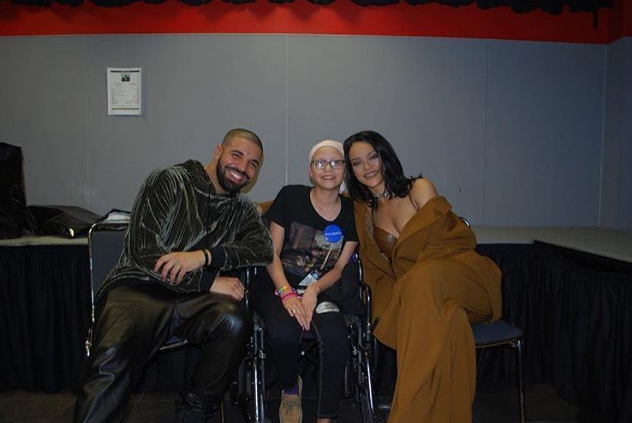 Flores reportedly met Rihanna and Drake last March in Miami via the Make-A-Wish Foundation. During that time, Flores said that she met the love of her life, pertaining to Drake, noting that it was the best day for her. She noted that the Canadian rapper was sweet and down to earth. Flores also shared that Drake gave her and her family some OVO clothing. Months after their meeting, Drake dedicated his latest album entitled “Views” to Flores. The opener for the album, “Keep The Family Close,” was especially dedicated to the then-cancer patient. He noted that he prays for the fan’s well-being every day. The passing of Flores comes days after Rihanna and Drake have been stirring romantic rumors since being spotted many times in London.